String, I quickly learned, is rubbish. It suffers from creep under the high pre-tension required for the rig to work. After doing lots of hunting [big thanks to previous inspired comments] I hit the jack pot with high tensile steel fishing wire coated with nylon. 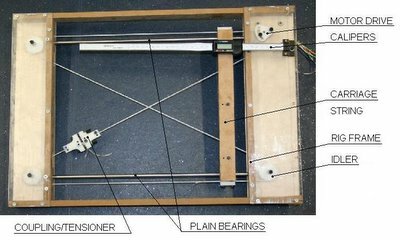 Cheap & accessible - ideal reprapability. A big problem with wire is its grip on the drive wheel grip. 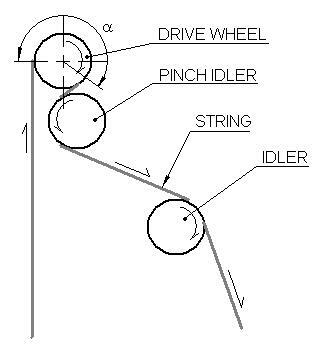 The figure below (left) shows the simplest drive wheel setup. Shrink wrap on the drive wheel certainly helped things, but with such thin transmission wire and a small (ø 12 mm) drive wheel to achieve high resolution (specifically without gears) the total grip was naff all. I tried a pinch assembly to increase the contact angle but that wasn’t enough either. And so the wire was wrapped at least once around the drive wheel. 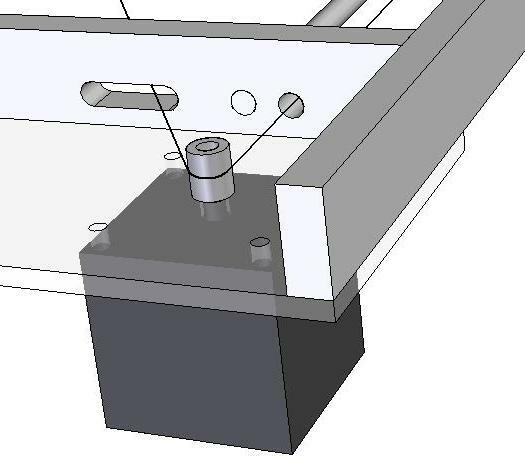 It solved the grip problem, but because it was wrapped it followed the Archimedes screw principle and rode up and down the length of the wheel when it was turned: bad news for repeatability and accuracy I thought, not to mention messing up the tensions. I tried everything I could to stop the wrap from riding, from shelves and curves on the drive wheel to constraint on the input & output. Absolutely nowt. The wrap will always ride. I went snowboarding, and reminisced about the pint I’ll never have whilst being mocked by chairlifts which are mostly made out of wire, pulleys and drive wheels. But I got back and thought “well lets let the wrap ride then”. What are the accuracies and repeatabilities like? Answer: Good. For the 10cm distance I could test it seemed repeatable (triple wrapped on a plain shrink wrapped drive wheel). There’s some mysterious jamming going on in my rig with an asymmetrical load (to be fixed with better bearing constraint), but when I put a timing belt on it, this made no difference and proved my wire’s innocence. 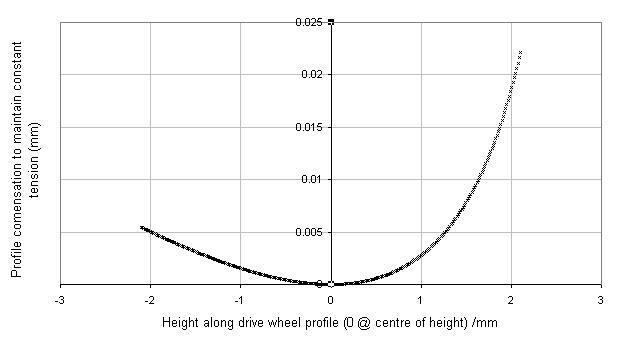 But I did some calcs & worked out an egg shaped profile for the drive wheel which would side step this problem. 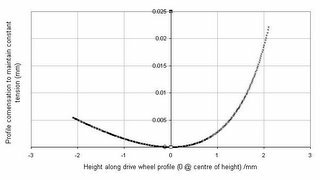 The graph below shows the dimensions of the profile which I think is doable (for an offset of 100 mm, pitch 0.5 mm & max carriage travel of 300 mm). So Adrian will certainly get the pint, but wire is not yet dead: it is the rebel faction in my transmission war and although I’ll be working with teeth for ARNIE Mk 1, I’ll be thinking of string. they cost about fifty quid. At one point, I owned a flatbed plotter. A Roland DXY100 or something. If memory servers, it used stranded steel cable, which was intentionally wrapped around the drive wheel. 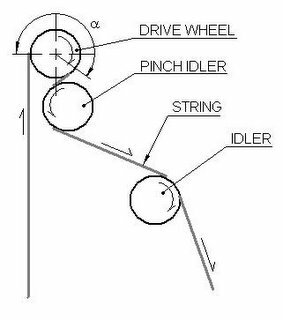 I don't recall an idler wheel. I think they just tensioned the crap out of it. I have a possible solution to the wire wandering on the main drive pulley. I've got a PDF to show you, but don't have a place to put it. Let me know if you would like to see it. I can email it or what not. Callipers: Zach got he best deal of about a fiver (£). Drafting supply house: don't have one. Besides, fish wire more available.Yo! Drafting supply house: don't have one. Besides, fish wire more available. If you want a high-grip pulley without multi-wrapping the cable, one thing I've found works really well is a rubber tap washer sandwiched between two steel mending washers. I used such an arrangement together with para-cord, connected with a crimped bit of pipe, to drive my ball mill. It would need a pair of idler pulleys to stop the wire sliding up and down, but the grip the rubber gives on the belt is phenomenal.